Isla de El Hierro is the smallest and most southern of all the Canary Islands. It is also the least populated which is a massive draw for those who prefer a more tranquil atmosphere away from the tourists. Nick named the 'Meridian Island', centuries ago it was considered the most western point known in the world at that time. However, with the discovery of America in 1492 that of course changed everything, although the island continued to remain a strategic location for navigation. One of the island's main attractions is the Lighthouse Orchilla which was commissioned in 1924. It was quite a feat of engineering to complete it due to its inhospitable and remote location presenting plenty of challenges. It was lit for the first time in 1933, and could be seen for 75 nautical miles. Today the lighthouse is no longer in use but continues to be of interest for many visitors. El Hierro was declared a Biosphere Reserve in the year 2,000, and 60% of its territory is now protected. The island has the largest number of volcanoes in the Canaries and was formed 1.2 million years ago after three consecutive eruptions. There has only been one eruption ever recorded and that was in 1793 which lasted a month. The main tourist attraction on the island is an area called Los Lajiales located in the southern corner near the village of La Restinga. Otherwise referred to as the badlands, it has a rough volcanic landscape and is about 6,000 years old. There are eight volcanoes in this area ranging from over 150 metres high to 437 metres. Another popular feature of the island, and one of the most visited, is the Well of Health. This is a Spa Hotel located right on the coast near the village of Sabinosa. The sulphur waters claim to have medicinal properties and have been known to heal circulatory conditions, as well as dermatological and rheumatic problems. Although many visitors come just to relax and de-stress. Also on El Hierro is a sacred tree called Garoe, which has an intriguing legend associated with it. It was a laurel tree which, because of its location where the trade winds hit the island, the water from the clouds would condense onto the branches and later pour rain around the island. The legend goes that at one stage it was the only source of drinking water on the island for the early inhabitants. Pools of water would form below and the Bimbaches would fill water chaffs and transport the water to villages around the island. They managed to avoid Spanish invasion for quite some time by keeping the location of the tree a secret, thinking they wouldn't stay if there was no source of water on the island. However, eventually the secret got out and the islander's were punished and put to death. The original tree was eventually blown down in 1604 by a hurricane, but a smaller tree has since replaced it and there are still natural ponds below where rainwater collects. Another unusual feature is the Lizard of El Hierro which is now an endangered species. The island used to have many of them back in 2nd century the island and they were never a threat to humans as they are not poisonous. They had plenty to fear from humans though, as there were indications that the early inhabitants had quite a taste for lizard meat. The Giant Lizard is quite a robust creature, and although slow to grow can live for 20 years. They measure about 60 centimetres and weigh up to 400 grams, which is quite remarkable if you compare it to the size of the common lizard on the island which is a third of the size and only weighs 10 grams. Throughout the year El Hierro celebrates several festivities such as the Feast of San Isidro in May, or the descent of the Virgen de los Reyes which is held every four years in July. The image of the Virgen de los Reyes was given to the islanders by some sailors in 1546 on their way to America in exchange for enough food to last them the journey. Whenever the island was hit by drought the islanders would pray to the Virgen and their prayers were always answered. Consequently a festival followed where the image was taken from village to village. This festival has continued to this day and takes place over a month with white flags, which are a symbol of peace, hung from the churches and public institutions. 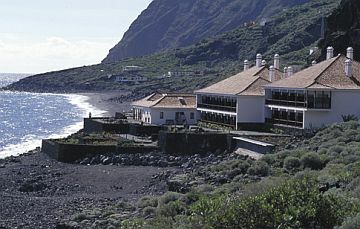 Although small in size, this fascinating island also benefits from having its own Parador Hotel El Hierro. This is a modern hotel located right by the ocean, so all the rooms have spectacular views. It has an elegant and rather colonial interior with a garden and seasonal swimming pool. There are also spa facilities with a gym, jacuzzi, turkish bath and sauna. The hotel also has an excellent restaurant serving exotic local dishes using local produce. This tranquil setting offers excellent cuisine, comfort and relaxation while you enjoy your stay in El Hierro.